Go to any Event that you are Attending. A pop-up will offer you two options for that single Event: Download or email. Highlight that link and copy it (or right-click it and choose Copy link location). Open Google Calendar in your web browser. 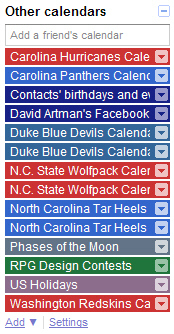 Under “Other calendars,” click Add > Add by URL. Paste the Facebook URL into the pop-up’s URL field. Note: You probably do not want to check the checkbox to make it public. Click Add Calendar and then wait a moment. A “Firstname Lastname ‘s Facebook” calendar should appear on your “Other calendars” list. Sync with your Android device or other Google Calendars client and enjoy!